Cylinders: 2.5L H4 16V GDI DOHC - 4 cyl. Navigation, Sunroof, Leather Seats, Premium Sound Package, Heated Seats! Subaru's winter event now on! The 2019 Subaru Forester has been redesigned inside and out to provide new comfort, technology, and connectivity while sacrificing none of the capability, versatility, and agility you expect from the iconic Forester name. With new technologies like X-Mode and SI-Drive, the 2019 Subaru Forester is now more ready than ever for those rugged mountain passes, while the comfort and infotainment technology keeps you connected and comfortable for the daily drives. This black SUV has an automatic transmission and is powered by a 2.5L H4 16V GDI DOHC engine. With that thrifty motor it gets 9.0 L/100 km in the city and uses just 7.2 L/100 km out on the highway according to Transport Canada. Our Forester's trim level is Premier Eyesight CVT. This premium, chromed out SUV has an 8 inch touchscreen infotainment system with GPS navigation, STARLINK smartphone integration (including Aha radio), Apple CarPlay and Android Auto functionality, steering wheel controlled audio, and a premium sound system. It also has a sunroof, steering responsive automatic headlights, dual zone automatic climate control, heated leather seats, a heated leather steering wheel, power memory seats, and a power tailgate. 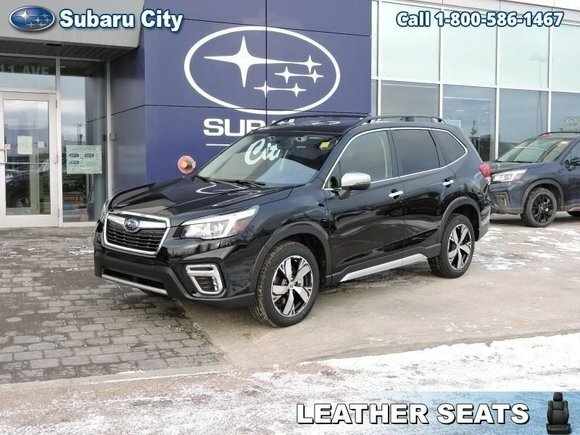 For unmatched safety, this SUV is equipped with Subaru's patented DriverFocus distraction mitigation system, SRVD, and EyeSight complete with pre-collision assist, adaptive cruise control, lane keep assist, and blind spot monitoring. This vehicle has been upgraded with the following features: Navigation, Sunroof, Leather Seats, Premium Sound Package, Heated Seats, Heated Steering Wheel, Power Tailgate. Want to try the 2019 Subaru Forester Premier Eyesight CVT?